Updated: It seems like Airtel has gone back to old rates on their website. We assume that they are currently in process of updating their servers with new plans. We are not of the opinion that it may be wrongly published. In our view, new rates should start reflecting soon.! It looks like Airtel has taken the first step towards sparking yet another price war for 3G internet in India. The largest mobile operator in India, who recently crossed 200 million subscriber milestone, seem to have made significant price cuts to their 3G internet plans. 2014 may be the year when you will see mobile data rates tumbling quite drastically. One, because 4G connectivity has started to slowly take roots in India. Secondly, Reliance Jio are expected to launch their services quite aggressively sparking price wars. Thirdly, the demand for faster internet is higher than ever, so it is slowly becoming a volume game. We did a comprehensive 3G data plan rate comparison last month and while relatively smaller operators like Tata, Aircel and BSNL has lower plans, the big three of the lot Airtel, Vodafone and Idea all had their plans in higher range (for example 1GB 3G plan was around Rs. 250, compared to others who had it at Rs. 150). But, now Airtel seems to have lowered it to the level of smaller operators. 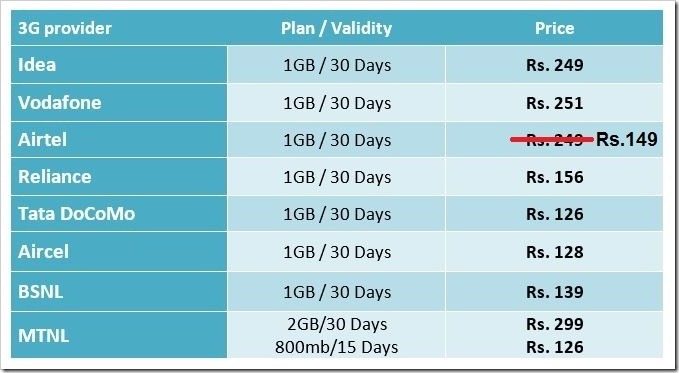 The standard 1GB plan (30 day validity) which was earlier for Rs. 249, is now priced at Rs. 149, a price-cut of over 40 percent. Here are the new prices for 3G data plans as they are listed on their website. The price cuts range from 33 percent to 45 percent. 2.5GB plan gets the maximum price cut of 45%, while the 10 GB plan gets a price cut of 33% equivalent to Rs. 500. Here is how the 3G data plan comparison chart looks now for all the operators for standard 1GB plan with 30 day validity. With largest operator making huge cuts, there are sure to changes in the offerings by others as well. Smaller operators will now need to cut their prices further, if they want to attract more customers, otherwise new (and existing) users will obviously run to Airtel. At the same time the likes of Idea and Vodafone will need to decrease their 3G rates to stay competitive. I am sure this chart will look very different from what it is looking now 3 to 6 months down the line. What is your take? "Airtel Slashes 3G Data Plan Rates By 45pc; 1GB For Rs. 149 Now! ", 5 out of 5 based on 1 ratings. Airtel is waste of money. Previously 296 pack use to provide me 600MB 3g/4g data which i use to use for entire month by just accessing whatsapp. Now after launch of jio airtel introduced rate cuter and introduced 148 recharge which will provide 1gb for 28 days. Today morning i recharged by this amount and accessed internet as usual. Within an hour just by using whatsapp chat 700MB got deducted from my total of 1000MB and only 300MB remained. I called customer executive and asked for the usage. They are like we don’t have access to your usage but without usage it wont get deducted. Trust me I only opened whatsapp and all my apps where closed from background and I even offed mobile data from other apps. There is no source of usage atall. This rate cuter is FAKE. AIRTEL is FAKE. They are CHEATING their customers by this FAKE service. As per my knowledge rate were going to change in 2 days but still not change. I also dont know the reason. air tel cheated with us. i recharge my phone on 23/03/204 after watching this on air tel website but i get only 1 gb data. Please see the update that we just posted. We are trying to get in touch with Airtel. The rates were different in the morning, and there is a screenshot of the same. They reverted back to old rates afterwards. It seems they are still in the process of making changes, and new rates should start showing up shortly. I don’t think this news is correct. the company website link you have posted still shows the old rates only. This is good news Arun. Thanks for sharing.